Timna Park is set in a stunning and absolutely magnificent desert setting and is South Israel’s one of the largest attraction. The park has a fantastic geology and history and offers a number of recreational opportunities including a few on the lake. The park covers an area of 15, 000 acres and has been built in a horseshoe-shaped valley that remains surrounded by cliffs. The very first copper mine in the world, Mount Timna stands right in the middle of it. 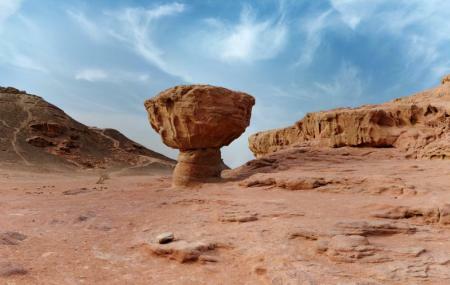 There are several hiking trails at Timna Park; both long and short ones which offer visitors the chance to observe the splendour of nature including the plants and wildlife. Amazing place. The views are incredible. Our group took Jeep safari trip with arvo Tours. It was so nice experience. There is visitor center. Cafe/restaurant and you can stay over etc. with your tent. I can highly recommend. Great geology place. A lot of of international attractions. You can enjoy history. Hike, get a bike, feel Earth like no other place. Just few minutes from airport or Eilat. Just Enjoy. Wonderful place especially to those who loves the desert. For a full experience, You would need a whole day visit. Highly recommend.